Just in time for Valentine’s day, gift your loved ones health and wellness to be valued for years to come. The special day is just a week away, with it comes the challenge of finding a gift that will be cherished forever. 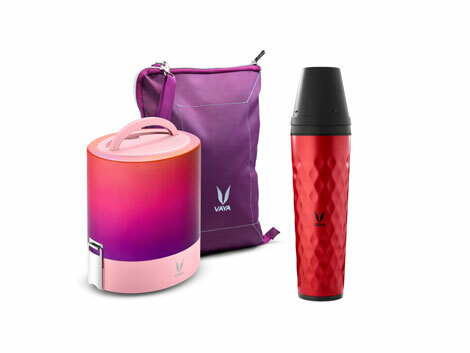 Vaya Gift Set comes with a high-end designer lunchbox and drinkware, thoughtfully put together to make the moment of gifting special! From classic and subtle hues to bright and bold colors in play, each Vaya comes with an exemplary design. This Valentine’s day, build your own Vaya gift set for the special person in your life, choose a lunchbox and drinkware that befits their personality and reflects your love! To spice up the experience, you can also personalize Tyffyn by laser etching the name of the recipient on it. Tyffyn, the spectacular range of lunchboxes from Vaya, has revolutionized the lunch scenario with VacuTherm technology that keeps food warm for 6 hours, and eco-friendly and aesthetically-pleasing designs. Made of stainless-steel and BPA-free materials, these lunch boxes are safe and functional, a combination that is hard to resist! Tyffyn comes in 3 sizes perfect for differently sized palates, in elegant designs and with BagMat, a smart shoulder bag that transforms into a mat when you need one! Vaya Drynk is a versatile water bottle designed with attention to most important details. The insulated drinkware range keeps your beverages hot for 12 hours and cold for 18 hours. Drynk comes with an anti-slip coaster base, a wide mouth for easy loading and cleaning, a slim design that is both easy to hold and fit in car door slots. Every Drynk is plainly beautiful, and comes with a gulper lid and 2 cups for sharing. The drinkware range from Vaya is perfect for steaming hot coffee, cold work-out drinks, warm infused drinks, and even conjee, rasam or soups with chunks of vegetables! Impeccably designed and well crafted, each product from Vaya is high on utility and functionality! Commenting on the occasion, Vashist, Founder and CEO of Vaya Life, stated “Celebrate love with a gift set from Vaya, for it is designed to make every day as beautiful as Valentine’s day. When you are gifting a Vaya, you are gifting a thoughtfully crafted every day essential that looks good and works incredibly well”.